Labeling nuclear DNA fragmentation and gel electrophoresis are methods to identify apoptosis. Programmed cell death, Apoptosis, is a necessary process in both animal tissue and plant tissue development. 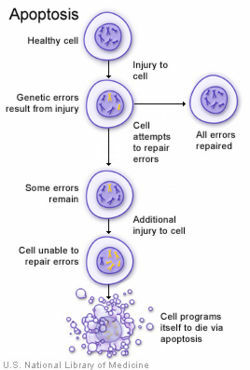 The cells grow and produce other cells, but also die, due either to Apoptosis or cell injuries. Dead cells are used by other cells. The cells may no longer be needed. When a baby is in his mother’s womb, his fingers or toes are connected to each other by connective tissue. While he is growing up, the connective tissue disappears through cell death (apoptosis). If the connective tissue does were not killed by apoptosis, the baby’s fingers would remain attached as with a duck’s feet. Research in the area of cell death indicates that apoptosis is a very important process in our body. Cell signals control process of apoptosis. These cell signals are either extracellular or intracellular. Apoptosis occurs within extrinsic pathway and intrinsic pathways. Extrinsic pathway occurs by the simulation of a death receptor which is located on the plasma membrane. (Ligands are signal molecules that simulate death receptors.) Intrinsic pathway occurs by releasing of signals within mitochondria cells. (Cellular stress triggers intrinsic pathway. Cell stress is caused by DNA damage and heat shock.) Studying and understand pathways of apoptosis will help to prevent and treat diseases. Diseases appear by disorder or modification of apoptotic pathways. Disorder and modification prevent normal function of apoptosis. Because apoptosis does not notice “use-by-date”, cells live longer or replicate and produce more cells. When unnecessary cells live longer, they can be cancer or disease. ↑ Gozuacik D.; Kimchi A (Apr 2004). "Autophagy as a cell death and tumor suppressor mechanism". Oncogene 23 (16): 2891-906. ISSN 0950-9232. http://www.readcube.com/articles/10.1038/sj.onc.1207521. ↑ Giorgi C; Romagnoli A; Pinton P; Rizzuto R. (Mar 2008). "Ca2+ signaling, mitochondria and cell death". Curr Mol Med 8 (2): 119-30. ISSN 1566-5240. PMID 18336292. http://endif.unife.it/dipartimento/medicina-sperimentale-diagnostica/sezioni-centri/sezione-di-patologia-generale/signaltransductionlab/publications/55.pdf. ↑ Tait1, W. G. Stephen; Green, Douglas R (February 15, 2012). "Mitochondria and cell signalling". Journal of Cell Science (125): 807-815. ISSN 1477-9137. http://jcs.biologists.org/content/125/4/807.full.pdf+html. This page was last modified on 16 April 2014, at 18:43.